Leclerc was well on his way to his first career Formula 1 victory, until the energy recovery system failed on his No. 16 Scuderia Ferrari SF90 with 11 laps to go. At that point, he was chum in the water. Hamilton ran down and passed him going into Turn 14, with 10 to go, and cruised to his 75th career victory. A timely safety car saved a podium finish for Leclerc, who was quickly losing time to fourth-place Max Verstappen. In the moment, he found it difficult to look on the bright side. Sebastian Vettel, after a spin just past halfway and losing his front wing, rallied to a fifth-place finish. Lando Norris, Kimi Raikkonen, Pierre Gasley, Alexander Albon and Sergio Perez rounded out the Top-10. Vettel took the lead from Leclerc going into Turn 1, on the first lap. On the fifth lap, Leclerc used a run down the pit straight to overtake Vettel going into Turn 1. After ceding the lead for one lap, Leclerc cycled back to the front on Lap 16. Hamilton pitted from second on Lap 36. Vettel followed suit on Lap 37. Leclerc and Bottas pitted the next two laps. For two laps, Hamilton and Vettel battled for third, in Turns 5, 6 and 7. On Lap 38, Hamilton used DRS (drag reduction system) and a massive head wind to overtake Vettel, going into Turn 4. “I just gave it everything and braked later than usual and dived down on the outside,” Hamilton said. On exit, Vettel got loose and spun out. He recovered and drove on. A few moments later, however, Vettel’s front wing fell off and he was forced to pit (rejoined the race in eighth). This set up the aforementioned finish, in which Leclerc’s power unit had a component failure and Hamilton passed him to win. 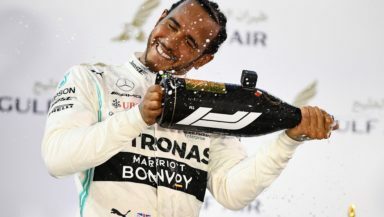 “I’m sure it was a devastating result for (Leclerc), obviously, because had done the job to win the race,” Hamilton said. Nico Hulkenberg and Daniel Ricciardo both suffered power failures in Turn 1, with four laps to go. This necessitated a safety car period, and the race ended behind the safety car (the eighth time in Formula 1 history). The race lasted one hour, 34 minutes and 21 seconds, at an average speed of 122.047 mph. There was one safety car period for four laps and four lead changes among three different drivers. Bottas leaves Bahrain with a one-point lead over Hamilton in the drivers championship. Mercedes leaves with a 39-point lead over Ferrari in the constructors championship. The next race is in China on April 14.